This is a simple and quick recipe that uses sauerkraut brine and a cabbage leaf to inoculate the ferment (bring desired bacteria). We inoculate this ferment because carrots go slimy very quickly under fermentation, so we want to speed things along. 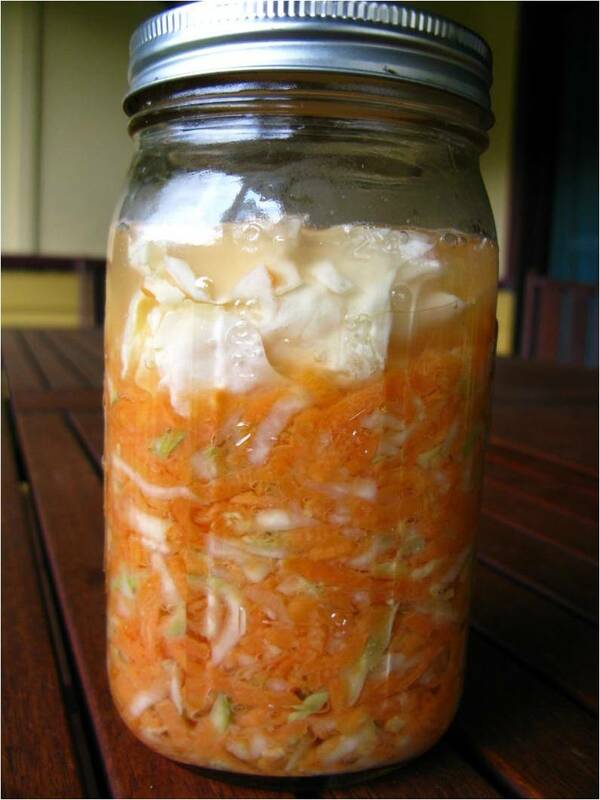 Don’t use whey (which has dairy-based bacteria) to inoculate a vegetable ferment. Grate the veg and place in a bowl. Add the brine and the salt, give a quick massage, then pack into a jar. Place the cabbage leaf on top, then weigh it down and seal the jar. This will be ready from 3 – 7 days depending on ambient temperature. The salt to veg ratio here is 1.1%, or 11 g/kg. 1 tsp of the salt I use = 5.5 g.Once the moisture is expressed from the veg, the brine strength will be near enough 2%.